Last season about this time, The Walking Dead debuted with its third season pulling a record-breaking 5.8 rating in the 18-49 demographic based on the overnight numbers. It broke that record again when it returned from its Winter hiatus with a 6.1 rating, then increased the bar yet again with its season finale which grabbed a 6.4 score. Logic of course dictates that at some point the series has to plateau and eventually start heading back down to Earth. Well, I’m here to tell you that logic can dictate all it wants, but that slowdown in The Walking Dead‘s numbers isn’t coming any time soon! On Sunday, the series had its fourth season bow with a jaw-dropping 8.2 rating in the 18-49 demo (!) and 16.1 million total viewers. That’s an increase from its Season 3 finale of 28% and has the show at an unprecedented ratings level. Not only does this make it the highest rated scripted cable television series ever, I can’t think of when a broadcast network series had a ratings score at that level anytime in the recent past. The Walking Dead easily beat out all competition on Sunday night on cable and the broadcast nets with the exception of football. And discussion series The Talking Dead (which immediately follows each new episode) also outpaced all non-sports airings for the night with a 2.6 rating and 5.1 million viewers. Third for the night? 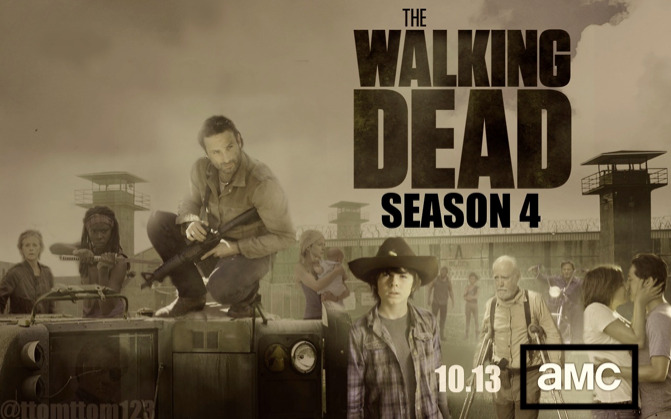 A repeat of the Season 3 finale of The Walking Dead which also pulled a 2.6 rating. Typically, a show–even some of the most popular ones–slip in the ratings each year, even if just a little bit. But not this series as it continues to be television phenomenon and it doesn’t look like it is going to lose steam anytime soon. A spin-off show is currently in the works and the parent series looks to remain viable for quite a few years to come. And with numbers like these, the show will almost certainly go out on its own terms with almost no threat of cancellation. Not facing as promising of a future is ABC’s new series Once Upon A Time in Wonderland. That spin-off show had its bow last Thursday and only mustered up a 1.7 rating in the 18-49 demo with 5.8 million total viewers. That’s not a disastrous debut, but then its not far from that mark either. The poor outing comes as no surprise, though, as ABC misfired with both Last Resort and Zero Hour in the 8 PM EST timeslot last year. That hour appears to be a bad one for dark, genre dramas and when they scheduled Wonderland there this year they stacked the odds against the show. The good news for those following the series is that the producers already planned on wrapping up the story at the end of the first season, so the show won’t leave you hanging. The question now is whether ABC will keep it in that hour or kick it to a Summer burn-off run at some point like they did with Zero Hour. If it slips much lower in the ratings, expect that move sooner rather than later. As for the other genre shows currently on television, last night Sleepy Hollow continued its ratings decline as it slipped to a 2.6 score with 7.5 million total viewers. Its numbers are still decent, though, and FOX already gave it a second season nod, so this slippage won’t cause them to change their minds on that (not yet, at least). Over on The CW, Beauty and the Beast pulled another paltry 0.3 rating with only a little over 900k total viewers. That series was pretty much DOA for this season anyway, and I expect to see it get cast off to Fridays or Saturdays pretty soon. On Sunday night, there were some other genre shows on the air apart from The Walking Dead and Lifetime’s The Witches of East End actually managed to improve its numbers from its debut. That show edged up to a 0.8 rating in the 18-49 demo with 1.9 million total viewers. And that’s with it airing in the same timeslot as The Walking Dead, though admittedly it is skewing to a different set of viewers. Still, those are good numbers for Lifetime and the ratings increase is a good trend. On ABC, in what has become a Prime Time wasteland as cable trounces all over the broadcast nets, Once Upon A Time slipped to a 2.4 rating with 7.5 million total viewers. That’s still not too bad, though, and it was the top non-sports show on the broadcast nets for the evening. On Friday night, ABC’s The Neighbors slipped again in the ratings, this time to a 0.9 score in the 18-49 demo with only a little over four million total viewers. With these numbers, expect the show to get kicked to Fridays–wait, it’s already there–make that Saturdays or yanked from the schedule altogether within the next few weeks. Or maybe they will let it just limp through the rest of Fall and disappear after mid-season. Also on Friday, Syfy’s Haven pulled another 0.4 rating with 1.6 million total viewers. Those continue to be iffy numbers for that network and the future of that show remains in doubt. On Thursday, The CW’s Vampire Diaries slipped down to a 1.0 rating with 2.1 million total viewers. It’s still one of that network’s best rated shows, for all that really means. Believe it or not, there are still a few more premieres of genre shows on the way, so check out the Fall schedule at this link. And keep an eye on the Cancellation Watch Twitter Site for the quickest ratings update and on this site for the latest analysis of how this season’s shows are performing.